Bill Moran is a professor in the School of Engineering at the RMIT University. Before joining the RMIT University, he was the Scientific Director of the Defence Science Institute (DSI) at The University of Melbourne. Bill’s research includes radar technology, theory and applications, information theory and applications, and sensor networks, including extensive collaboration with US and Australian defense agencies. 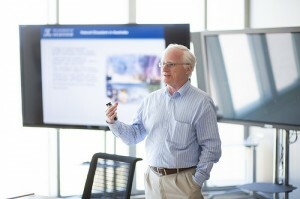 Bill brings world-leading expertise in the foundations of sensor fusion, communication, and computation in sensor networks.